Snyder: "It's Trump Vs Schumer For All The Marbles"
The stage is set for a battle of political willpower that could potentially be unlike anything that we have ever seen before in American history. Last Tuesday, there was a shouting match in the Oval Office that changed everything. 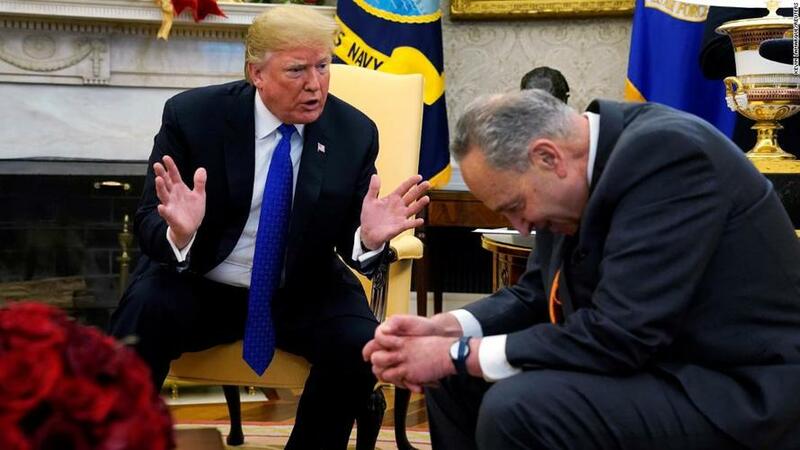 During a very heated exchange with Nancy Pelosi and Chuck Schumer, President Trump boldly declared that the border wall will get built and that he would be “proud to shut down the government for border security”. The Democrats are going to take control of the House of Representatives in January, and so Trump realizes that it is now or never for his top campaign promise. If he doesn’t get funding for the wall now, he will never get it, and he will go into the 2020 election without anything to show the voters on his signature issue. Trump has essentially painted himself into a corner, and maybe that is what he intended to do. Perhaps he understands that this is the time to take a stand, and perhaps he is ready to do whatever it takes to achieve his goal. But if he is not willing to do whatever it takes, then he should never have made such bold statements. Because if he backs down now, he will lose all credibility with millions upon millions of American voters. Senate Minority Leader Chuck Schumer (D.-N.Y.) said on the Senate floor on Thursday that there will be no funding for President Donald Trump’s plan to build a wall on the U.S.-Mexico border because the Democrats in Congress will never allow it. “I want to be crystal clear. There will be no additional appropriations to pay for the border wall. It is done,”Schumer said. There is no possibility of a compromise with Trump in that statement. Somebody is going to come out of this as a big loser. Will it be Chuck Schumer or will it be Donald Trump? Whoever loses this cage match will essentially be neutered politically. In the end, this fight doesn’t have a thing to do with money. The five billion dollars that Trump is asking for is a pittance when compared to the enormous sums of money that are poured into other programs. If Trump was asking for five billion dollars for roads that would be no problem at all. Ultimately, what this is about is a battle of the wills. Donald Trump wants a border wall and the Democrats are absolutely determined not to give him one. Coulter, who also writes a syndicated column, linked to an article in the Washington Post that details what new construction has occurred along the U.S.-Mexico border. The article reveals that none of the wall Trump pledged to build in his 2016 presidential campaign has been built. Some new fencing — not a wall — has been erected in Calexico, Calif. But this area to fence was identified by the Border Patrol in 2009 and the material is “bollard fencing,” which is hollow steel beams spaced several inches apart, reported The Post. This is the moment when Trump will really show us how committed he is to a border wall, because if he doesn’t get funding now he will never, ever get it once the Democrats control the House. It’s a perilous moment for the Grand Old Party. Either Trump folds and backs off his demand for the wall — the signature promise of his 2016 campaign — or the government will shut down over the holidays. Like previous government shutdowns, not that much will actually change for the first few days. But the longer a government shutdown lasts, the more painful it will become. Things will really start getting hairy once some people eventually stop receiving government checks, and it will take a tremendous amount of resolve to keep going at that point. This could be a defining point in Donald Trump’s presidency. If he is a man of his word, he will force a government shutdown and fight for what he believes. But if he caves and gives the Democrats everything that they want once again, the entire nation will know that he is just another typical Republican.